Here we going with this again. 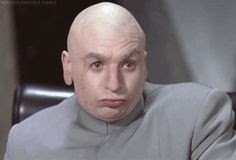 I'm always cracking a joke, whether speaking, or at work, blogging, emailing, on the phone. You name the place, I'm not taking it too seriously. When I write, I take time to craft my words. First is clarity. It has to make sense. Second is smoothness. It's important that what I say reads well, and doesn't beat the same words to death. Lastly, it's for humor. Whether a comical phrase, alternating alliteration along the avenue, breaking out lame puns or clichés, or rhymes, I try to make what I type fun to read. Hence, what I call the Sox box. As you may know, the Sox box, which is fun to say, is a 5000 count box that contains one of each White Sox card released from 1980 forward. Now, relics and autograph cards are not found in the Sox box. These are only base and inserts, sorted by set. It's a work in progress, because we all know the crapton of cards in the 35 years since 1980. I don't like stuffing it full, so I have moved 2011 and newer to a smaller box - mini Sox box. We can do this all night, Jeff. This was a recent move thanks to a couple large mailings filled with cards I was sorely lacking. First up is Fuji from Chronicles of Fuji, he of the flea market finds. Like most of the other envelopes, it's less of a trade and more of a "here - take this". Ok. So much glorious 90's goodness. With each passing year, I these more and more. Not sure how they will look in the 2030s when Archives gets in that part of town, but right now, they are so the world of slouch socks and Nagels. Oh wait - those are from the 80's. You are making my neck hurt. Best part of the Sox box is when you have the card in another location, you still need a copy. 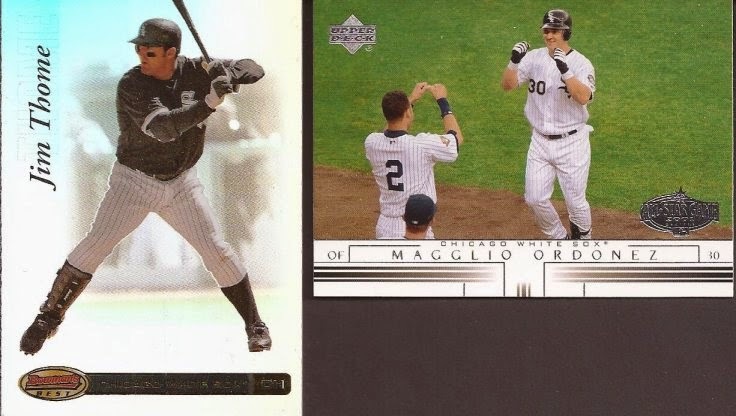 All ChiSox I receive that has a player in a throwback is first destined for the binder. 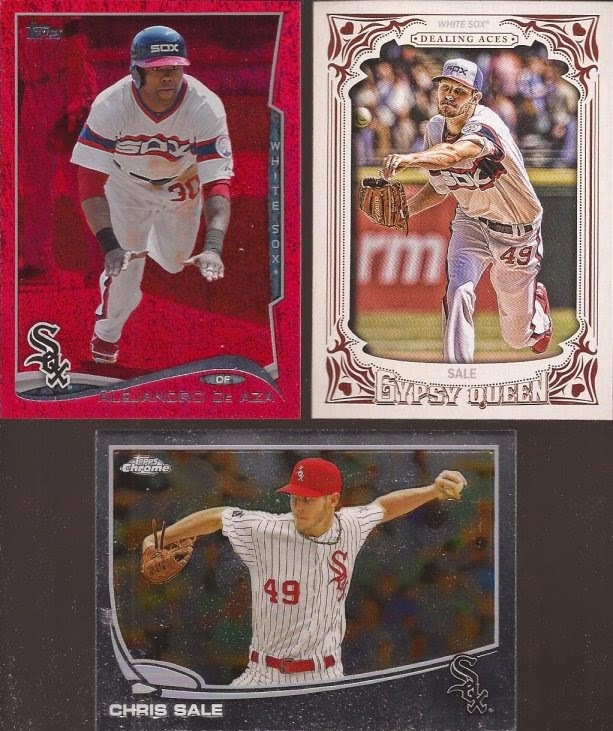 Then future rectangles go into the Sox box (or mini, as these three ended up). Ok - not all I got from Fuji hit the Sox box. Player collections also get first feeds, so here are three additions to two binders. Can I just say that Topps Gold Label rules? Each time I see a card from that set I love the release. 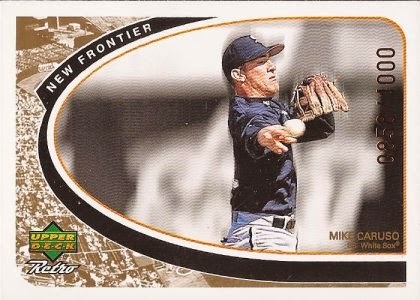 Lastly was this serialed card from UD Retro. Not sure on the design, but 90's cards, amiright? Thanks for the package, Fuji. The other sender that beat up the Sox box was Drew from Drew's Cards. Drew put up teams piles. Make a claim and he sent you the cards. Heck yeah I'm in on that. For a card dump, it was a hell of a card dump. This did not make it to the Sox box. I think I like these so much because they are such a sharp contrast to the flagship release of the same year. Then again, that is a great photo. Oh, "just recent releases" you say. Well, every card you see (and a few more not scanned) are new. 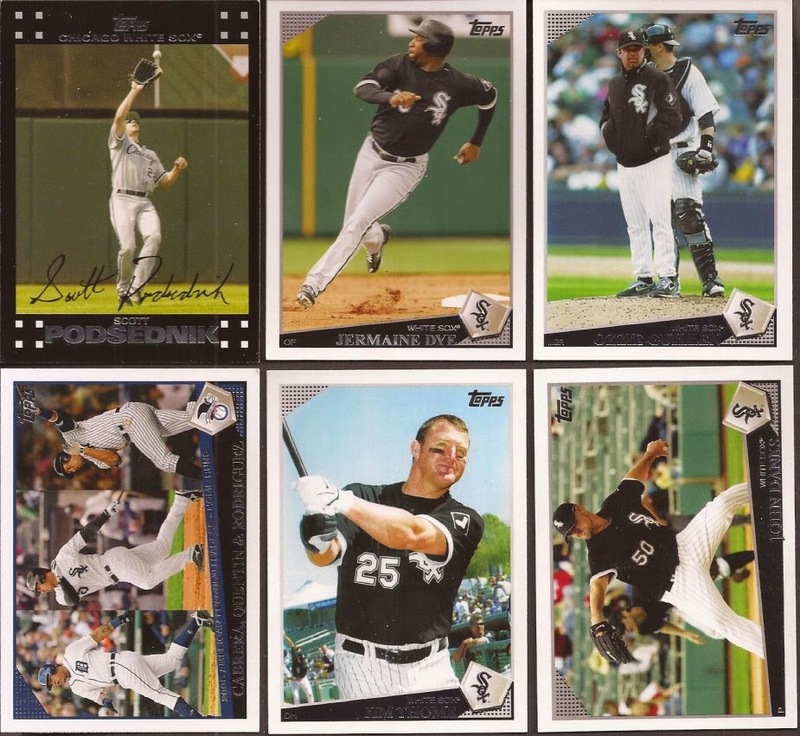 As much as my early 90's cards are low, the mid 00's are severely lacking in White Sox cards. 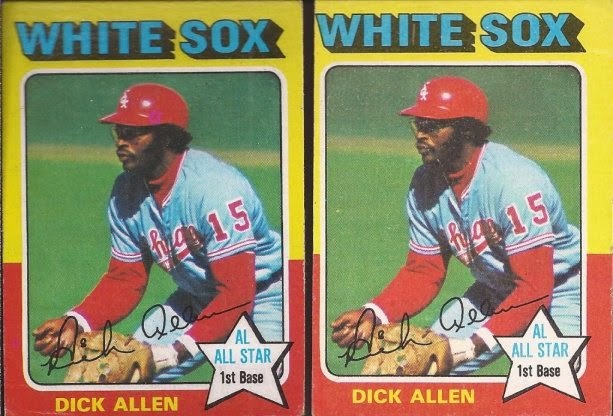 Ya know, I might have a want list available for some Sox teams sets. I'm guessing somewhere near the top of this page (hint, hint). More of that sweet mid 00's goodness, with a Jeets cameo to boot. Lastly was this card. Yummy yummy vintage. But Drew only sent one of those. The card on the left came from Drew. On the right was the current card in the early team set binder. Take a guess what binder that card was moved to..... Give yourself +10 if you said "miscuts". 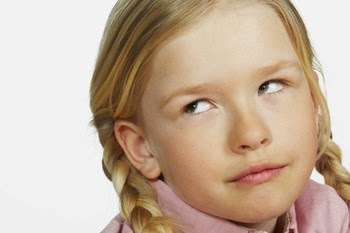 Give yourself a kick in the pants if you said "Jeff, I have no clue why I even read this crap you type". Thanks for the cards, Drew. Ya know - this post didn't have a lot a humor in it. Maybe I should rethink who I am. I don't care what anyone thinks, I still love Neil Diamond. Neil Diamond shines, in my book. Jeff, you crack me up - on a regular basis! Neil Diamond is awesome -- and so is this post. I'm never really sure what to call these envelope exchanges... since 90% of the time I'm shipping out random stuff and receiving the same. It's rare that I actually even negotiate a trade for a specific card anymore. So I'm curious... are these trades, blind trades, or care packages? Lol... I've heard different bloggers use different terms. In the end as long as we're having fun, I guess it doesn't matter. P.S. I think my mom had a huge crush on Neil Diamond. Can't tell you how many times I heard Song Song Blue growing up.